Friday Fives: Christening To Do List! So as I have mentioned previously, we are having Tyne christened on 28th April. I thought it was a great idea to have the Christening early as we wanted to do it while we're still in Liverpool, and I thought it would be cute to have him christened while he's still teeny weeny. What I wasn't banking on was just how quickly the 4 weeks would go between his birth and the Christening! Meaning its suddenly crept up on me and now there is only a week to go before the day! eeeeek! We are having the service at our local village church - St Marys. This is the church where I was christened as a baby, and so was my little sister - my sister's two children were also christened here so its become a bit of a family tradition! So when choosing where to have Tyney christened there was never any question that the service would be here! We met the Vicar last week and he is lovely, so we're looking forward to the day. For the after-party, we had a harder task in choosing a venue - there are lots of nice function rooms around but as I have some guests coming from further afield (Devon and Newcastle) I didn't want to choose anwhere too far away as it would be a pain for people to have to drive any distance. So I knew I wanted a venue within the village we live in - which meant not a great deal of choices. We enquired at the local pubs but the function rooms there are either too big or too small, and they all insist that you have their own catering which we really didn't want - so instead I enquired about hiring the local children's centre. We viewed it last week and it is perfect! Its a very old fashioned village hall with lovely high beam wooden ceilings - very Olde Worlde! It was the perfect size for our estimated 30-40 guests, so we went ahead and booked it! Having the venue chosen helped me when it came to deciding on a theme - because of the look of the hall and the fact that everything is taking place in our little old fashioned village, I decided that I wanted a Vintage/Village Fayre kind of theme for the day. Which means that - along with some Christening Day banners and balloons - we will be having Vintage themed flags/bunting, plates, etc. The tablecloths will be pale blue and there will be lots of little vintage touches here and there. 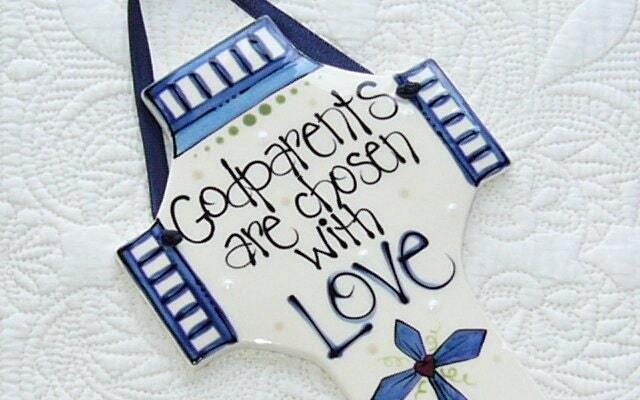 The hardest part of arranging a christening for me was deciding on who to ask to be Godparents. I thought about it on and off for the duration of the pregnancy, and eventually decided to choose people who I felt were good positive role models for Tyne and who had made an effort or shown an interest in him since his birth and during the pregnancy. I eventually decided on 3 Godfathers (My Uncle Gary, My cousin Peter and Jon's best friend Mike) and 2 Godmothers (my sister Laura and one of my best friends Sarah). I am sure I have made good choices and that these people will be a great influence on Tyne as he grows up. Choosing an outfit for Tyne has been probably the most fun part of organising the Christening! I love looking at all the cute little outfits. However because he is soooo small, its not been that easy to find something suitable as a lot of the suits are only available for ages 3 months + - and there is no way Tyney Tot is going to fit into any of those!!! The outfit we went with had to be in Newborn size, and a lot of those were very plain - I found I didn't really like the plain outfits, and preferred something with a bit of colour in it. When it came to choosing an outfit for me, things were much harder! I hadn't really thought about how difficult it would be to find something to fit and flatter me just 4 weeks after giving birth by c section! :/ I have tried on ENDLESS dresses this week and none of them have been suitable! So I have decided to just go with a nice simple maxi dress - easy to wear & comfortable! - I have chosen one in a fabric that I think matches the vintage theme well and in a colour that will go nicely with the baby blue colours of the day. The good thing about a maxi dress is that it means I can wear nice comfortable flat shoes, instead of tottering around in high heels all day! I will be dressing it up with a nice fascinator in my hair. My mums buffets are always popular with our family at any events, so luckily for me she has volunteered to do the food for the day! We have been coming up with ideas for food that fits in with our Vintage theme, and I am really pleased with what we've decided on! We'll be having a cold buffet full of things like sandwhich platters, wrap platters, potato salad, pasta salads, etc - we'll be buying most of the platters from Costco as the quality is really good and it saves the hassle of having to prepare everything the night before! We will also be serving Hot Jacket Potatoes with a Help Yourself filling station - people will have the choice of yummy hot and cold fillings, such as Chicken curry, Chilli con carne, baked beans, Cheese & Coleslaw. As well as this, we will also have a manned hot dog stand serving nice hot Hot Dogs! I will be putting Vintage inspired cake stands on each of the tables filled with little afternoon tea treats such as French Fancies, Mini Muffins and home made Butterfly Cakes which I will make myself the evening before with the help of my niece Amelie. As for drink, I HATE boozy Christenings so I really wanted to avoid having people sitting around getting drunk and drinking lager from cans - Tacky!!! So instead, I will be putting bottles of wine out on the tables and will serve a welcome drink of Prosecco with fresh raspberries to the adults and Fruit Juice to the children. I don't want to deny the men a drink, but instead of having horrible cans of lager out I will be serving Pitchers of beer instead. For entertainment for the kids, we have hired a Candy Cart - which I think fits in well with the theme! Did you have a christening for your little one? Do you have any tips for me? As always i'd love to hear from you!! Sounds like you've planned a wonderful day; be sure to show us photos of the big event! I really need to start putting more thought into stuff hehe. Absolutely love the cake as well - so unique!